Abstract : Post traumatic hepatic artery aneurysm is a rare cause of hemobilia especially in pediatric age group. A case of post traumatic hepatic artery aneurysm managed successfully by selective hepatic artery embolisation is reported. Case Summary: A 5 year old boy had history of fall while trying to ride the school bus. USG revealed hepatic injury which was initially managed conservatively . On 5th day patient developed hemetemesis and referred to our institute. Upper GI endoscopy revealed blood coming from CBD. CT-Angiography showed pseudo-aneurysm in the branch of left hepatic artery. Angiography with embolisation of the aneurysm was done with coils. After one week of embolisation, patient developed hemetemesis again. Repeat high resolution CT revealed, properly placed coil in situ with collapse of aneurysm with blood in CBD indicating hemobilia. Conventional angiography revealed collapsed aneurysm with collaterals around the aneurysm. Fibrin particles were injected into the collaterals. Patients is doing well at 2 years follow up. 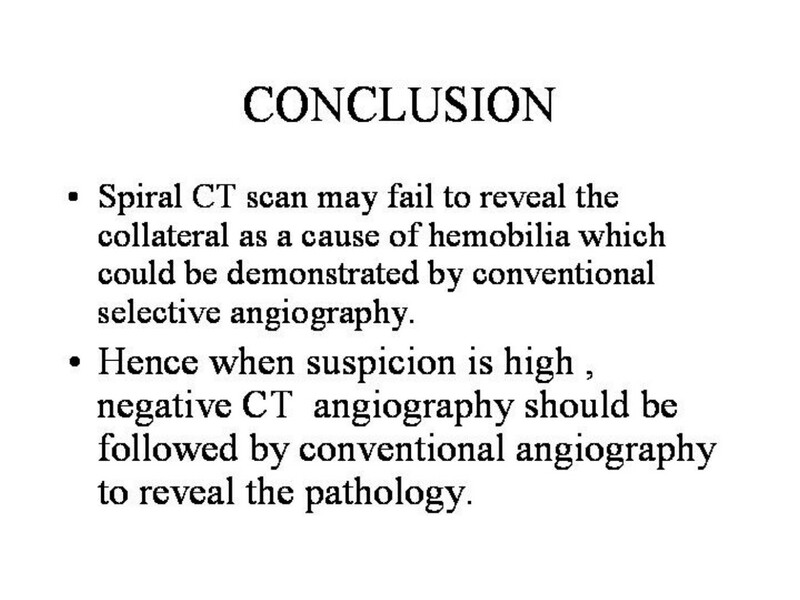 Conclusion : Spiral CT scan may fail to reveal the collateral as a cause of hemobilia which could be demonstrated by conventional selective angiography. Hence when suspicion is high, negative CT angiography should be followed by conventional angiography to reveal the pathology.